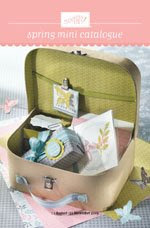 Bizzi Hands: Spring Mini Catalogue is HERE!!!! Click here to view it online. Just email me at bizzi.hands@gmail.com if something takes your fancy - there are a couple of small single stamps that would be great for someone starting out. I haven't been able to have a play as yet, as I have been working on my daughters (yep I have two) 21st birthday which is on tuesday, with most of the family arriving from the eastern states... we are on a count down - 7 sleeps to go.